Web developers confront a bunch of little problems in their day-to-day life, so it’s always nice when utilities can help simplify those problems. 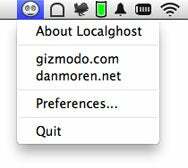 Take Scott Wheeler’s free Localghost 1.0 , which simplifies the problem of editing your computer’s hosts file to point certain domain names towards your own computer. The hosts file is kind of a local override for the Domain Name System; it allows you to force a specific domain name (say www.example.com) to go to another site. In the case of Localghost, it serves one particular function: defining domain names that point back to your own computer, using its loopback address (that’s the IP address 127.0.0.1, also known as localhost—hence the program’s name). Localghost’s interface and capabilities are bare bones, but it does just what it says on the tin. You can create and maintain a list of domain name’s in the program’s preferences, then use the menu bar icon to enable or disable any number of those domains at will. You can’t, however, instruct domain names to point to anything other than the localhost and neither can you point certain domains to certain ports on your computer, though the developer plans to add the latter feature in a future update. In either case, while Localghost is not necessarily a one-stop hosts file editor, it ought to simplify matters for many web developers.